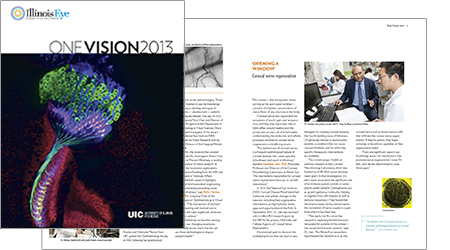 This annual report for the Illinois Eye & Ear Infirmary at the University of Illinois Chicago spotlights groundbreaking research. Design: Warren Group | Studio Deluxe. "The dysfunction of corneal nerves is a frequent pathological feature of corneal diseases that cause opacities (cloudiness) and result in blindness," explains Sandeep Jain, MD, Associate Professor and Director of the Corneal Neurobiology Laboratory at Illinois Eye. "The mechanisms responsible for corneal nerve regeneration have not yet been fully explored." A device reminiscent of futuristic science fiction may soon help the virtually blind see again — "almost like something out of Star Trek," says Jennifer Lim, MD, Professor and the Marion H. Schenk Esq. Chair in Ophthalmology Research of the Aging Eye. The UIC Hospital & Health Sciences System is the only center in Illinois selected to offer the artificial retina, which allows patients with very low or no vision to see shapes, edges and movement in black-and-white.